The Samajwadi Party (SP) and the Telugu Desam Party (TDP) have rightly criticized the reported decision of the Election Commission (EC) to drop the Office-of-Profit Case against Mrs. Sonia Gandhi in the Office-of-Profit Case following her resignation from the Lok Sabha. 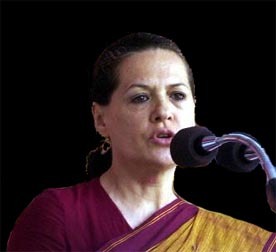 The Election Commission has sent its recommendation to the President for closing the case against Mrs. Sonia Gandhi. The matter is not so simple, harmless and innocuous as the Election Commission or the Congress Party would have the nation to believe so cozily in this matter. The Telegu Desam Party had submitted a complaint to the Election Commission seeking disqualification of Sonia Gandhi, Karan Singh, Kapila Vatsayan and Subbi Rami Reddy from parliament for holding Offices-of-Profit. The Election Commission has now written to the Telugu Desam Party asking them to substantiate the allegations against three leaders only ' Karan Singh, Kapila Vatsayan and Subbi Rami Reddy. Is not the honor of Sonia Gandhi more important and vital than the letter and spirit of the Indian Constitution? The people of India would like to know why Sonia Gandhi's name has been dropped by the Election Commission. If Jaya Bachchan can be disqualified with retrospective effect, in what way is Mrs. Sonia Gandhi enjoying a special status above the law of the Constitution? The straight and simple course is for the Election Commission to apply the same law with the same effect in the sane manner along the same channel for the same reason and finally for the same result in respect of Sonia Gandhi as well. In Euclid's geometry, one of the main axioms is that the shortest distance between two points is a straight line. That seems to have been made applicable to Jaya Bachchan by the Election Commission. But the Election Commission has not applied pari passu mutatis mutandis the same axiom in respect of Mrs. Sonia Gandhi, Karan Singh, Kapila Vatsayan and Subbi Rami Reddy. In respect of the Congress Supreme-Weight of Sonia Gandhi who is above the Law of the Constitution ' apart from all the other Laws of the Land ' the Election Commission would be guided by the Oracular Axiom descending from No.1 Janpath which clearly lays down informally, but no less emphatically as a word of command, in respect of Sonia Gandhi and the other members of her family, the shortest distance between two points is not ever not a straight line! This axiom has been applied with enthusiastic, cavalier and military authoritarianism by the Election Commission in a shameless manner in respect of Sonia Gandhi who is the de facto Prime Minister of India. It is no small wonder that our non-descript de jure Prime Minister (whom Winston Churchill would have loved to describe as a 'sheep in sheep's skin') has chosen to describe Sonia Gandhi as the tallest leader in India today! Bias or prejudice is such an elusive condition of the mind that it is most difficult, if not impossible, to always recognize its existence. But here the Election Commission has left us in no doubt about the fact that they are out and out for Sonia Gandhi and against everybody else in this matter! Election Commission has become a shining symbol of barbarous discrimination of the Middle Ages. As a former Civil Servant, if not as a civil serpent(! ), I know that discrimination is unavoidable in the Army, in the Navy and the Air-force. In the Defence Services, some people must be assigned to dangerous positions or missions; others have to be deployed in soft spots. The Election Commission seems to follow such a policy in trying to bail out Sonia Gandhi by trying to consign lesser mortals to their condemned places of allotted death! The Election Commission is declaring with gusto to the helpless people of India: 'Please understand that the difficult and exacting choice between liking Sonia Gandhi and disliking others is legitimately arbitrary if not unconstitutional. What cannot be cured has to be endured in the larger interest of our own Offices of Profit if not responsibility!'. 'Our progress in degeneracy appears to me to be pretty rapid. As a nation we began by declaring that 'All Men Are Created Equal'. We now practically read it as 'all men are created equal, except Negroes and foreigners. When it comes to this, I shall prefer emigrating to some country ' where they make no pretence of loving liberty ' to Russia, for instance, where despotism can be taken pure, and without the base alloy of hypocrisy'. Bernard Shaw said my way of joking is to tell the truth. The bitter truth is that in so far as our wretched country is concerned today, the UPA Government and the Election Commission in India are treating all the Indians as negroes and foreigners in the sense implied by Abraham Lincoln in the above quotation andSonia Gandhi as the one and only legitimate and patriotic Indian.